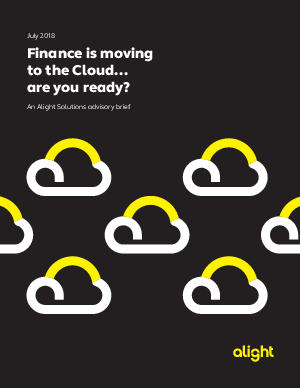 Research Library > Alight Solutions > Finance is moving to the Cloud... are you ready? As much as moving to the Cloud has been a hot trend over the past several years with Human Capital Management systems, in today’s world, financial management systems are not far behind. We’re starting to see the activity significantly ramp up within the financial management system space. So much so, that according to research done by Gartner, the Cloud is expected to become the dominant deployment model across all areas of financial management applications by 2025. Spending on cloud or SaaS-based applications will increase from 30% of the total market spend in 2015 to 47% by 2020. So which financial systems are organizations shifting to the cloud model and why is this happening—aside from following the trend in HR?